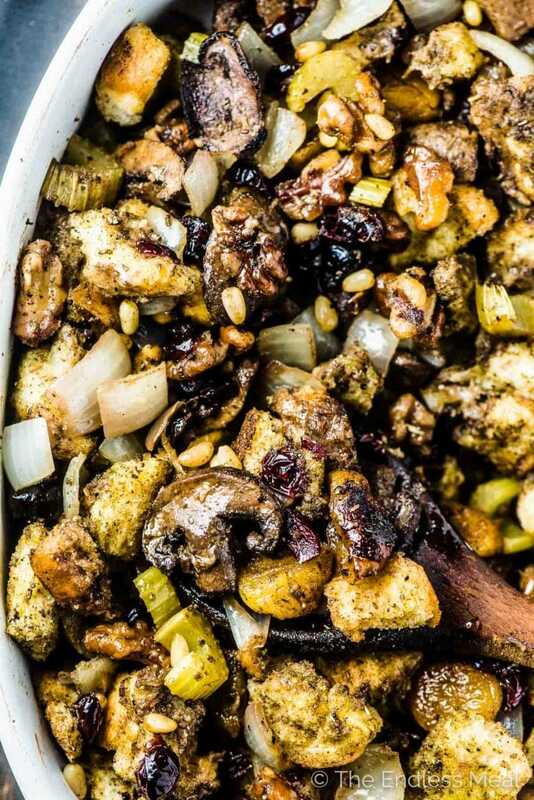 This really is The Best Stuffing Recipe Ever. It's full sweet cranberries and apricots, crunchy walnuts, mushrooms, onion, and celery. The veggies keep this stuffing perfect moist without ever becoming soggy. It's our family's go-to Christmas and Thanksgiving stuffing recipe! This is the Thanksgiving stuffing recipe we have been making for years. I know that claiming that it is the best stuffing recipe ever is quite a gigantic claim, but it's 100% true. Seriously, it's the best. When I first shared this recipe with you back in 2012, it was my handsome man who made it for me. Since then, it's become out go-to stuffing recipe. I have a feeling that once you try it, you'll make it for all your turkey dinners. The bread is always perfectly moist. It's never dry. It's never soggy. All this perfectness is thanks to our friend, mushrooms. They release their moisture as the stuffing cooks which means that you don't need to pour tons of stock over the stuffing risking making it soggy. Apricots and cranberries. They take first place in the reasons I love this stuffing recipe list. They add just the right bit of sweetness and go so well with a big turkey dinner. Walnuts! And pine nuts! They soften when cooked and give a great bite to the stuffing. It's so ridiculously easy to make. 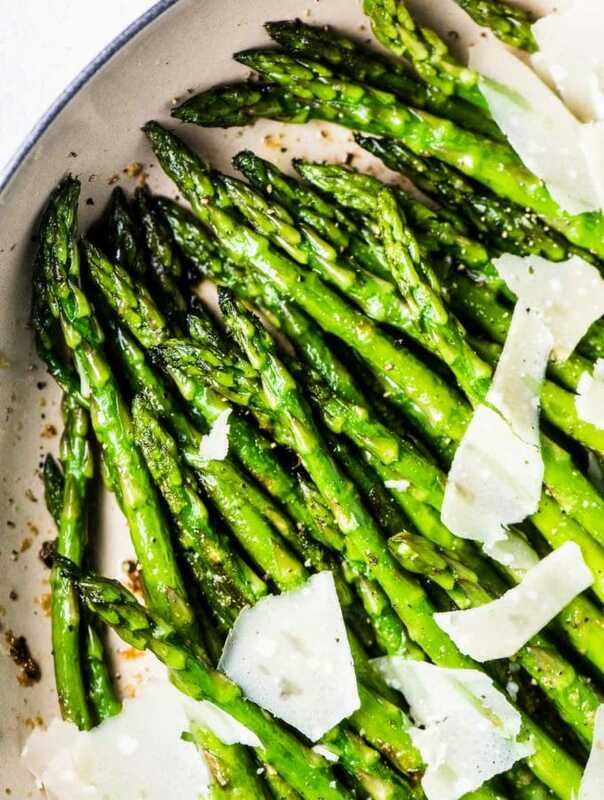 Toss everything together in your biggest bowl then pack it into your casserole dish. See that bowl filled to the brim with all the ingredients for this bread stuffing? Please don't copy that picture. Be smart and choose a MUCH larger bowl. You'll want room to mix everything together without spilling half the ingredients. Trust me on this one! In many ways, this is very similar to an old fashioned bread stuffing recipe. There are lots of onions and celery, poultry seasoning and pepper. And (obviously) bread. Kind of hard to make bread stuffing without that one important ingredient! 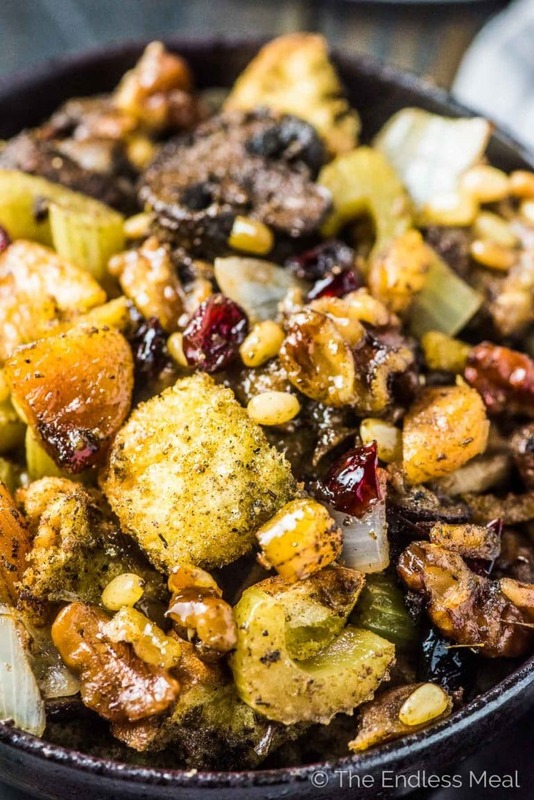 What takes this from traditional to the best stuffing recipe are the nuts and fruit. Two simple additions that rock the stuffing. Once you try them in this stuffing recipe you'll seriously wonder how you ever ate stuffing any other way. If you're making stuffing to go with your Christmas dinner this year, I beg you to make this one. It really is the best stuffing recipe ever. Also, does anyone not make stuffing to go with their Christmas or Thanksgiving turkey? That thought has me a little worried. 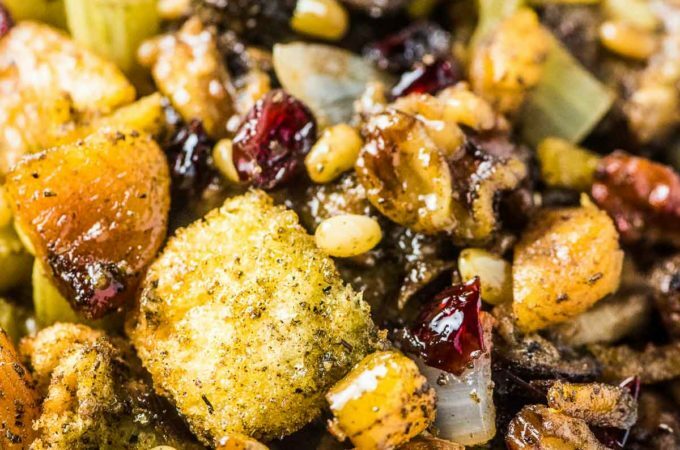 This really is The Best Stuffing Recipe Ever. It's full sweet cranberries and apricots, crunchy walnuts, mushrooms, onion, and celery. The veggies keep this stuffing perfect moist without ever becoming soggy. It's our family's go-to Thanksgiving and Christmas stuffing recipe! 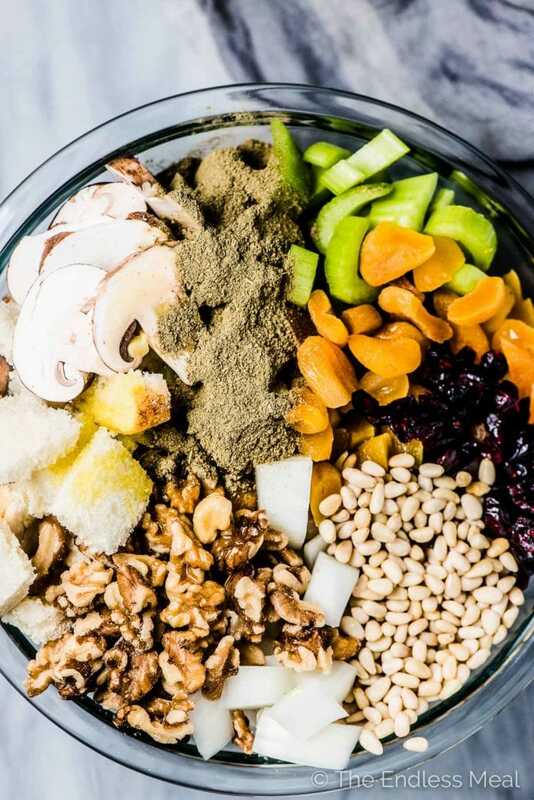 Combine all ingredients in a large bowl and toss to combine. That's it, seriously! 1. Either stuff the cavity of the turkey before you roast it in your oven. Remember that a stuffed turkey will take a little longer to cook. 2. Preheat your oven to 350 degrees. Place stuffing in a lightly greased ovenproof dish and cover it tightly with aluminum foil. 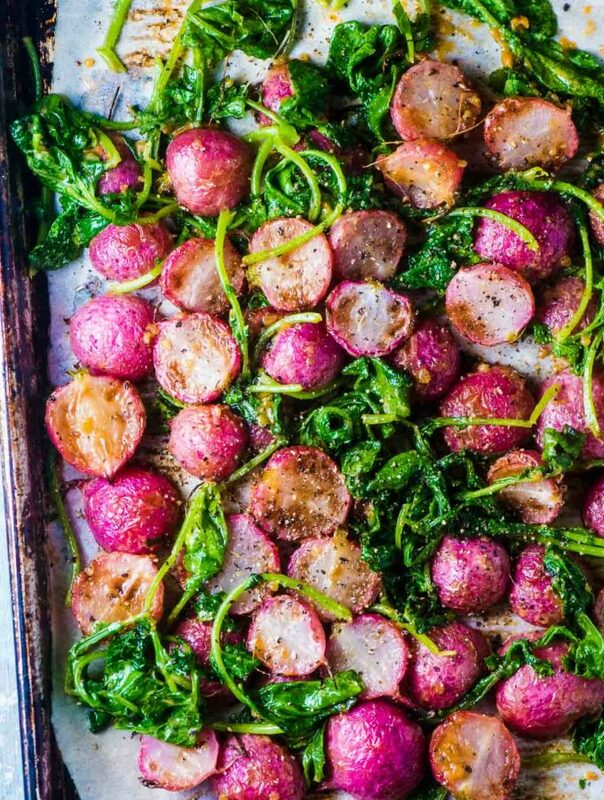 Bake in the oven for about 40 minutes, or until the bread is soft and the veggies are cooked. It is good if the vegetables still have a little crunch. Lay bread cubes on 2 large baking sheets and set aside for 2 days. Gently toss after the first day to make sure they are drying evenly. To speed up the drying process, put the bread cubes on baking sheets in your oven at the lowest temp. This will take about an hour. Watch them closely though, you don't want to make toast. Bake the stuffing for 30 minutes then remove it from the oven. Leave the stuffing on your counter and once the turkey comes out of the oven, put the stuffing back in for 15 minutes. do you have to dry the bread first? 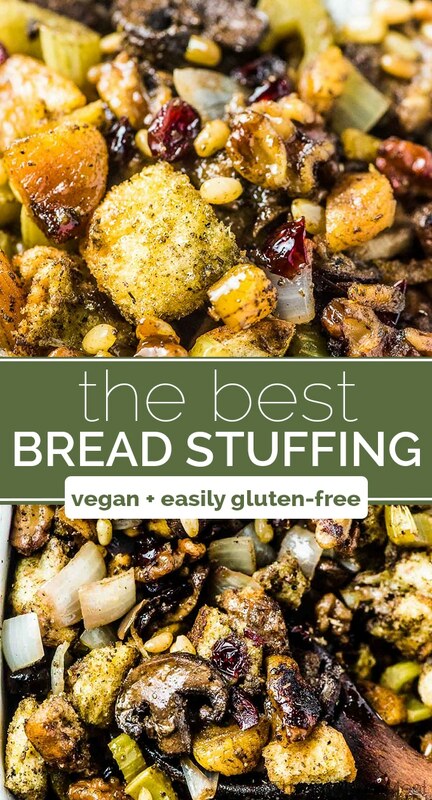 I find that stuffing is better with slightly dry bread. There are instructions in the notes about how to do this quickly! We made this yesterday! It was delicious!! Thanks for posting!! Heading shows easily gluten free. I made a gluten free dressing last thanksgiving and it was lackluster. Switching out the regular bread for gluten free in this recipe, I wonder if anyone has ever tried it and how it turned out. How do you make this gluten free? I am in charge of stuffing every Thanksgiving. 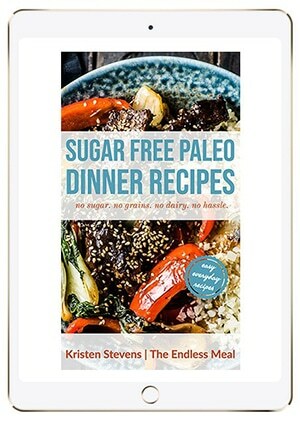 I just found you recipe. It looks amazing. My brother smokes the Turkey so no need to stuff. How many people will your recipe serve? Hi, I was wondering what can I use instead of mushrooms? What about diced apples? The mushrooms release a lot of moisture into the stuffing, which is why you don’t see any broth or other liquid in the ingredients list. If you choose to simply leave them out, I would add about 3/4 cup of broth. I hope you have a great Thanksgiving! Thank you I will try the diced apples. Happy thanksgiving and thank you again the sharing your recipe ? Am totally in agreement regarding stuffing… what is a roasted turkey without it! It’s a must have! I’ll be making this recipe next week for Canadian Thanksgiving. Yum! This looks amazing & I’d like to try out…but what exactly is in this item called poultry seasoning? Thanks for your help! Poultry seasoning is a mix of different spices, usually sage, thyme, marjoram and rosemary. You can find it in the spice section of your grocery store. Hope you love the stuffing as much as I do! How many slices of bread would you say equals to 4 cups of cubed bread? Thank ou for your quick response! Making this tomorrow for a christmas dinner! I really want to try this recipe out on Thursday! Wondering though if this is just like a dry crouton kind of stuffing? There’s no liquid in it so wondered. Also, do you think it would become more of a traditional stuffing texture if I added mushroom broth to it? No it is like a traditional type of stuffing. The mushrooms, onions and celery release a lot of liquid during cooking so you don’t need to add any extra. I’ll admit I was pretty skeptical when my guy made this for me last year. I was convinced it would be really dry but it turned out wonderful. I’ve made it twice since and and it has been moist and perfect every time. Lots of great ingredients. 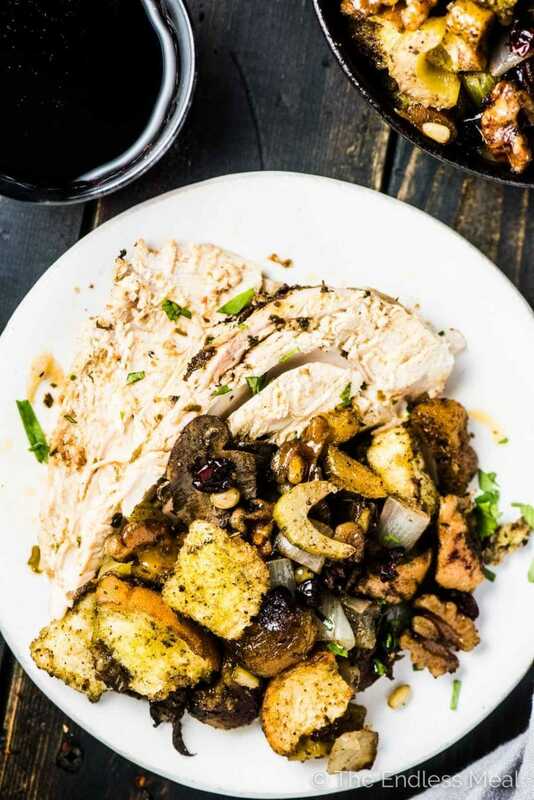 We always have stuffing with our turkey. If we didn’t have stuffing I think everyone would be disappointed.